Explanation: Hurtling toward its destination, the high resolution camera on board ESA's Mars Express spacecraft recorded this tantalizing view of the Red Planet earlier this month on December 3rd. Seen from a distance of 5.5 million kilometers, features across part of Mars' western hemisphere are bathed in sunlight. 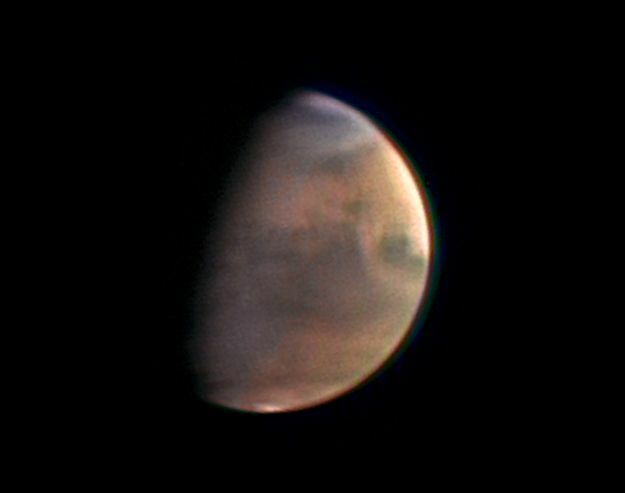 The Martian night side is also prominent from the spacecraft's perspective, a view not possible for Earthbound telescopes. Launched on an interplanetary voyage of exploration in early June, Mars Express carries with it the Beagle 2 lander, scheduled to be released from Mars Express tomorrow, December 19th. Mars Express and Beagle 2 will then continue the journey separately, but both are scheduled to reach Mars on December 25th, with Mars Express entering an elliptical orbit and Beagle 2 descending to the Martian surface. Two more invaders from Earth, NASA's Mars Exploration Rovers, will arrive in January.